I’ve always been a little intimidated of trifles: they seemed to require a lot of careful layering, along with a special serving vessel. Plus, I didn’t know the first thing about making either ladyfingers or custard. Then I read this article, and I realized that trifles, like so many other desserts, are actually far more flexible than I gave them credit for; the layering that I thought was supposed to be crisp and tidy, for example, is actually supposed to be gloriously drippy—messy, even. 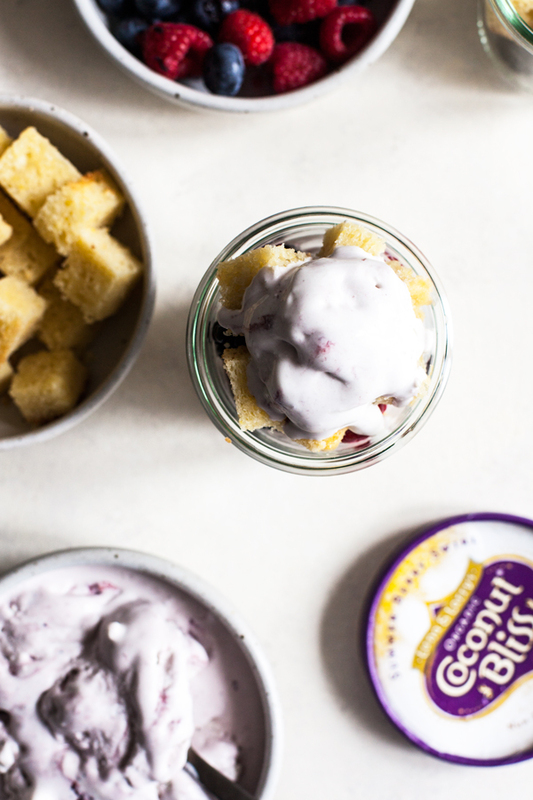 These mason jar trifles with berry swirl ice cream and vegan lemon cake make things even easier: the single-serve sizing means that you don’t have to assemble more dessert than you need, and the custard layer is a cool, creamy ice cream whip that comes together in about a minute. 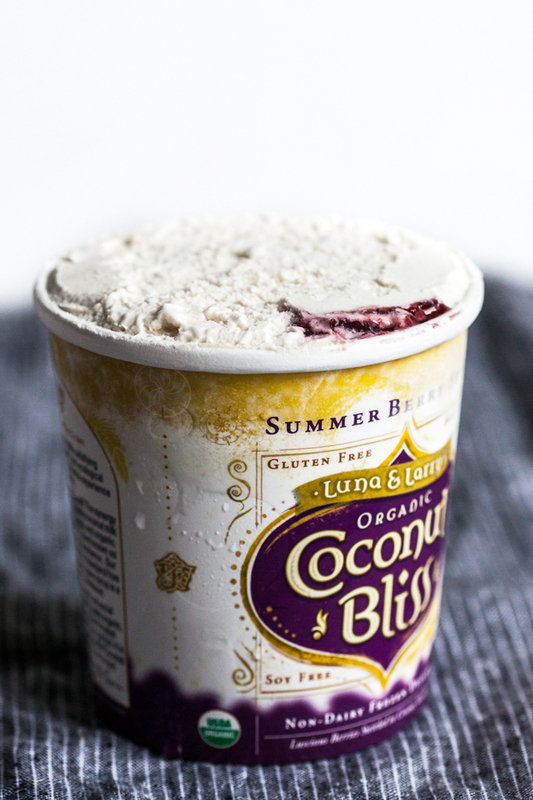 The ice cream in question is the summer berry swirl ice cream from the folks at Luna & Larry’s Coconut Bliss. I first tasted this coconut milk ice cream at a Vida Vegan conference years ago, and I immediately thought to myself that anyone—vegan, dairy free, or curious omnivore—would fall in love with the ultra-creamy texture. I’ve shared it enthusiastically with friends ever since: without fail, they marvel at how good it is. Early this summer I gave the Vanilla Island flavor to my mom for a taste test, and she couldn’t believe it was vegan! Coconut Bliss was founded in Oregon’s Willamette Valley in 2005 by Luna Marcus and Larry Kaplowitz. The two formulated their ice cream base using a hand-crank ice cream maker purchased from a thrift store, and they came up with an ice cream base that was magically rich and decadent. The company has been operating out of Eugene, Oregon, ever since, and it has expanded to offer fifteen pint flavors that include such deliciousness as Salted Caramel & Chocolate, Vanilla Island, and Chocolate Chip Cookie, as well as six ice cream bars. This spring, Luna & Larry’s also started making ice cream sandwiches. I sampled them as soon as I could, and I thought that the hemp seed chocolate chip cookies were every bit as delicious as the ice cream itself. 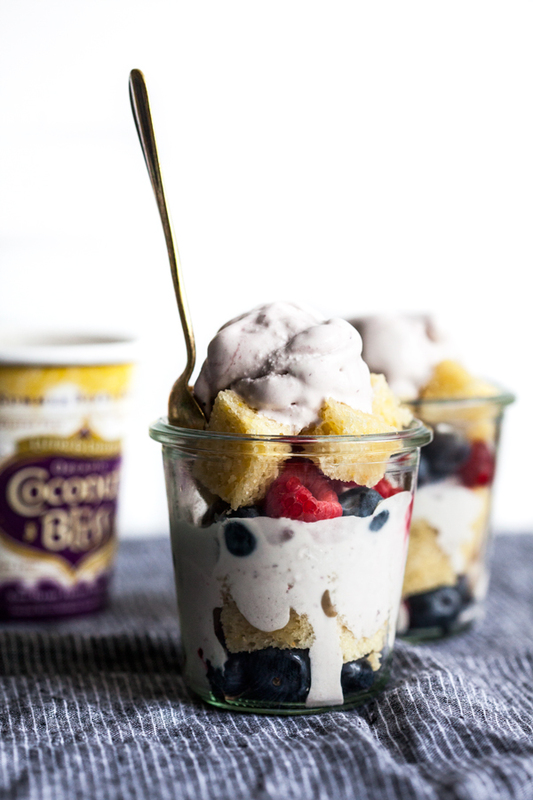 All of the Coconut Bliss flavors are organic, dairy-free, gluten free, and soy free, and so are their mix-ins, which is great news for those with food allergies. 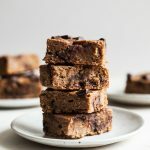 The chocolate chip cookie flavor is one of my favorites—it features delicious pockets of soft, vegan chocolate chip cookies churned into a vanilla base—and I love that I can share it with friends who are gluten free. The brand also uses fair trade certified cocoa, chocolate, and coffee. 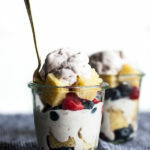 My goal for these trifles was to feature the summer berry swirl—a vanilla base with ribbons of organic wild blueberries and blackberries—in all of its sweet, simple goodness, and to give it a slightly “whipped” texture for the recipe. It wasn’t difficult to do; the ice creams are already so creamy that it’s easy to stir them into swirls. I let the ice cream sit at room temperature until it was softened, then transferred it to a mixing bowl, added a tablespoon or so of non-dairy milk, and used a spatula to stir it until it was pillowy and easy to layer. You could easily do this in a food processor, but it’s not necessary. For the cake layer, I wanted to create something that was both gluten free and vegan, to match the ice cream, and simple enough to add flavor to the recipe while also letting the berries shine. Vegan, gluten free lemon cake to the rescue! Now that I’ve got this recipe in my back pocket, I think it’ll be a go-to when I’m baking for GF friends and clients. It’s moist, tart, and so easy to make. I use a homemade GF flour blend here because I tend to find that they’re most reliable. If you’d like to substitute all purpose flour, that’s fine, and you can also use a gluten-free, all-purpose blend: just use one that you’ve tried and trusted in your baking. 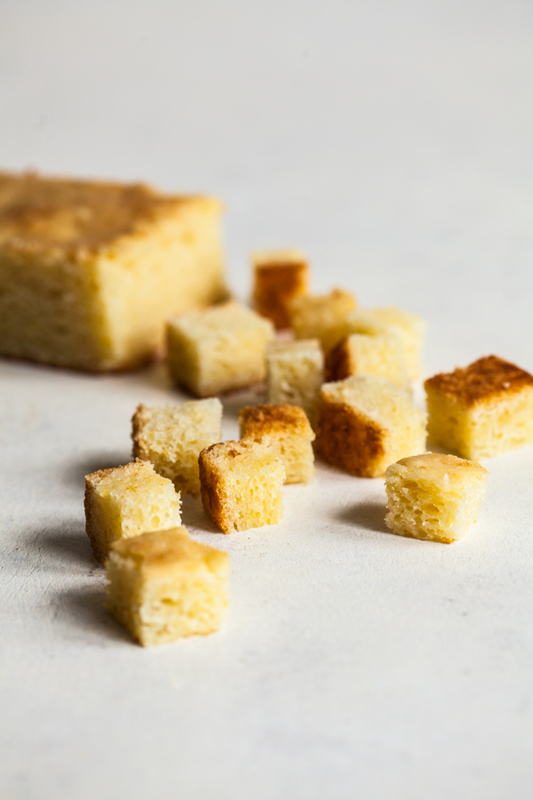 I was really happy with a combination of chickpea flour, superfine brown rice flour, and starch: it made a cake that was light and fluffy, but also sturdy enough to cut into cubes for the trifles. Preheat your oven to 350F. Lightly oil and flour an 8 x 8 or 9 x 9 square baking pan. Zest and then juice the lemons; you should have about 1/3 cup juice and a couple tablespoons zest. In a large mixing bowl, whisk together the brown rice flour, chickpea flour, potato starch, tapioca starch, xanthan gum, baking soda, baking powder, salt, and sugar. In another bowl, whisk together the oil, vanilla, cold water, and lemon juice. Add these wet ingredients to the dry ingredients and stir until the batter is well incorporated and smooth (don't be afraid to mix well; without gluten in the batter, over-mixing isn't a big deal). Pour the batter into your baking dish and bake for 35-40 minutes, or until the top and edges of the cake are golden and the center is solid. Allow the cake to cool completely. Cut the cake in half, then cut half of it into cubes. The remaining half can be wrapped or transferred to an airtight container and stored at room temperature for up to 3 days, or frozen for up to 6 weeks. To make the trifles, transfer the ice cream to a mixing bowl. Add a tablespoon or two of non-dairy milk and use a spatula to stir the ice cream until it has a swirled, soft, almost "whipped" texture. 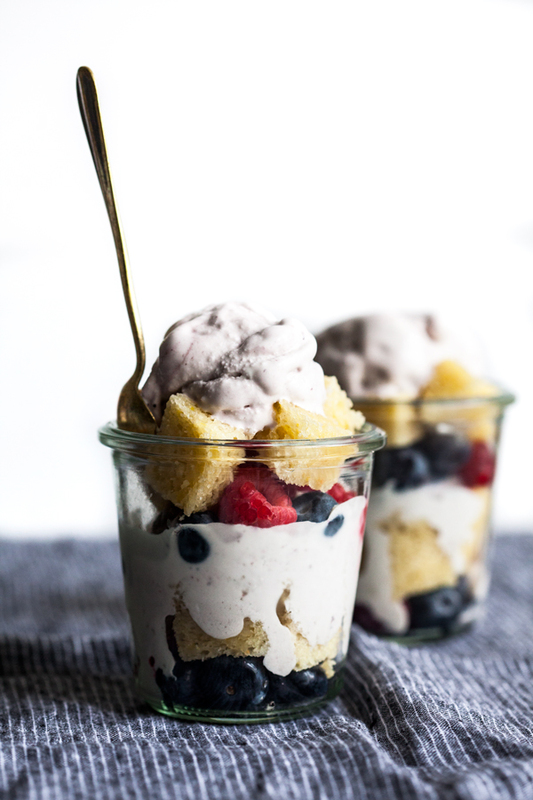 Place a small handful berries at the bottom of each mason jar, then top with a layer of cubed lemon cake and a layer (about 1/4 cup) ice cream. Repeat, then repeat with all remaining mason jars, finishing with a generous scoop of ice cream on top. Serve quickly! In place of the flour blend here, you can use 1 3/4 cups all-purpose or whole wheat pastry flour, or you can use 1 3/4 cups of a trusted gluten-free, all-purpose flour blend. 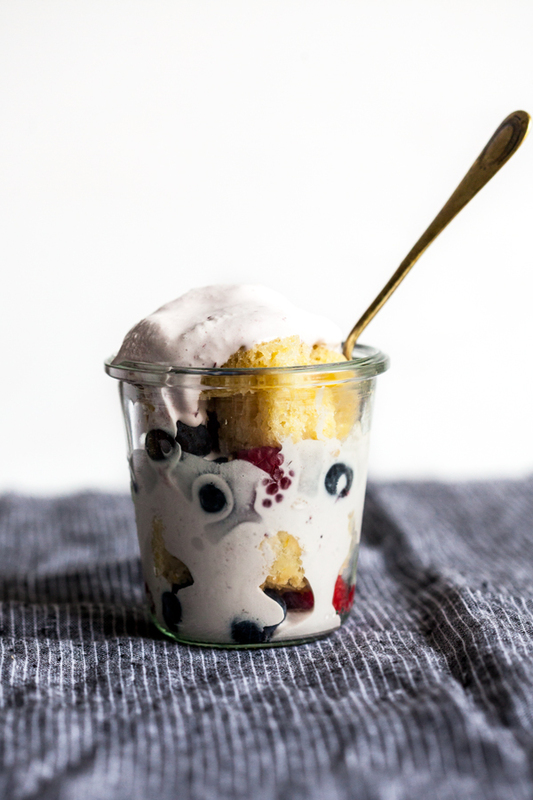 The ice cream will most definitely melt as the trifles sit, but when it does, it’ll just soak into the lemon cake, which definitely isn’t a bad thing. 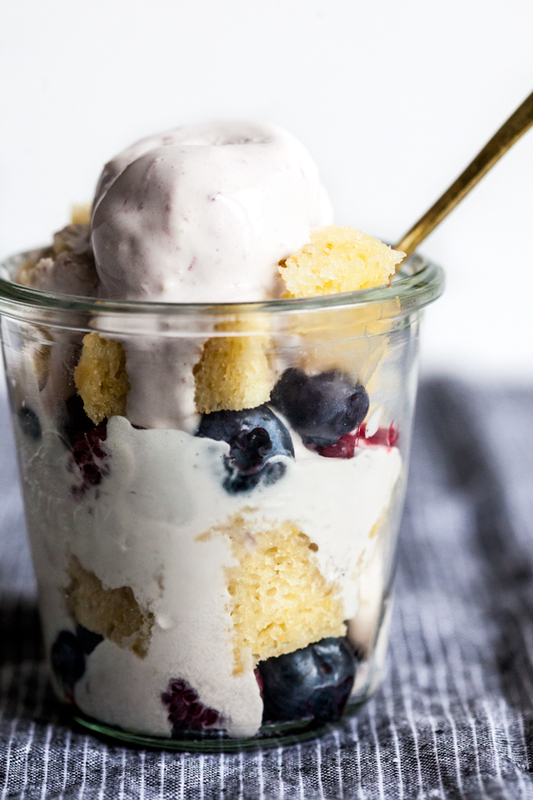 The combination of cold, creamy ice cream and tender cake is delightful, and the berries add pockets of tart, sweet, and fresh flavor. Be sure to work quickly when you’re layering the trifles, so that the ice cream stays cold and firm enough; if you need to take a break, transfer the ice cream to the freezer until you’re ready to start layering again. And if you’d like to make a bigger trifle size, that’s totally cool: I just like the presentation and ease of the single-serve option. 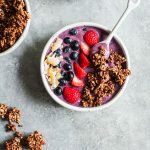 “I couldn’t live without ice cream” is something I hear almost as often as “I could never live without cheese.” For so many people who are considering the switch to a plant-based diet, the idea of life without dairy is daunting. I’m grateful that we have so many dairy free options nowadays—options that deliver on the richness and creaminess of dairy in a way that’s suited to please everyone. And I love that Luna and Larry’s keeps adding new flavors and treats to their roster, so that that the vegan ice cream family can continue to grow. I’m thinking about trying the trifles with plums or peaches in August, and I’m guessing that roasted apples would be delicious in the fall. Hope you give the recipe a whirl with any fruit you love, and feel free to use a favorite cake recipe or another tasty base (blondies? brownies?). The more fun you have experimenting, the better! This post is sponsored by Luna & Larry’s Coconut Bliss. 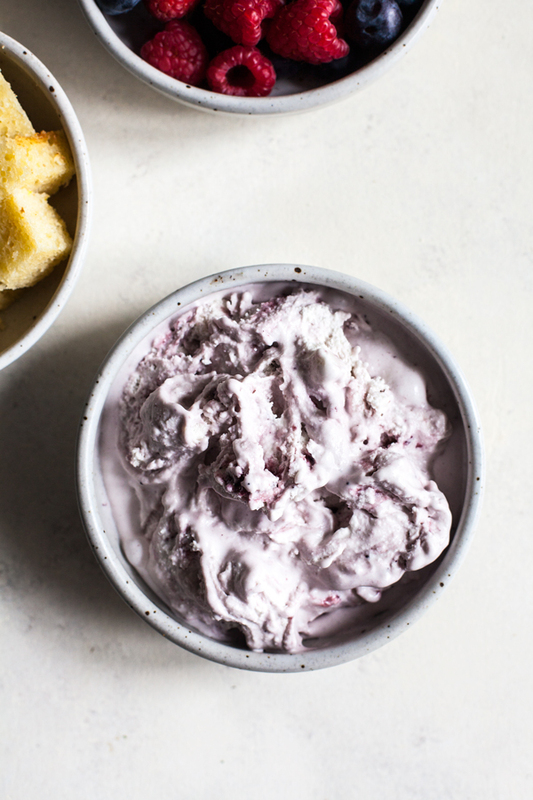 All opinions are my own, and I loved creating this recipe with the brand’s crowd-pleasing, dairy free ice cream. Thanks for your support! This looks so amazingly craveworthy and perfect for summer! I love the presentation. I am embarrassed to say that I still haven’t tried Luna and Larry’s but now I really want to! Love this! Have you tried Nadamoo ice cream? would love to hear your thoughts on it and how it compares to coconut bliss as I have not tried this brand. 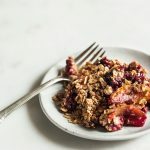 These look stunning and i love the presentation.I keep on checking your blog for different lipsmacking recipes.So now i will try this recipe and satisfy my craving for dessert.Allergic to potato starch so is there any alternative to potato starch? please suggest. So glad you like the recipe! I would substitute tapioca starch, so 1/2 cup tapioca starch total, rather than 1/4 cup of each starch. Omg this is inspired! I must make it now. The recipe looks amazing and the preparation is not that hard to follow. I can’t wait to show this recipe to my girl, she will love it. Tracy, most blends do include some xanthan gum or have been formulated to work without it, so yes, that’s what I mean! As for oil, I honestly don’t know. I find that gluten free and vegan baking usually needs to be pretty precise, and without the oil I’m not sure that the cake would be tender the way it’s intended to be. Not trying to discourage — just being transparent because I haven’t tried it myself! You made me crazy by sharing this receipe!! It will definately give me a change from routine ice cream menu. Thanks again for sharing.